There are many insurance policies that you should have, like term life, home insurance, critical illness as well as comprehensive and collision for your car. There are however some insurance products that you might want to skip. The first policy in this series is mortgage life insurance. Mortgage life insurance insures the remaining amount of your mortgage in the event of your death. While this insurance is very convenient to get, since the banks offer it when you sign your mortgage, you can likely get term life insurance for less money. Since mortgage insurance covers the mortgage, you’ll have to apply for new insurance if you move to another bank. This can be an issue if your health situation has changed since your last application. Term life is also a better option as it covers a set dollar amount, where mortgage life insurance is covering an ever-declining amount, your mortgage principle. On top of all that, CBC’s Marketplace ran a story on people being denied their claim, accused of lying on their original application form. If you become a victim of identity theft, an identity theft policy covers lost wages and any other expenses you incur to clear it up. It does not cover the actual loss, since this is often covered by the bank. The majority of crimes classified as identity theft are unauthorized purchases with a stolen credit card number. This can usually be dealt with with a phone call and sending in any information you have to back up your claim. So if identity theft doesn’t insure the loss, and it obviously can’t protect you from the crime of identity theft, is it worth the cost? You might decide it’s not. Identity theft insurance can cost $25-$50 a year, and if you eventually need to make a claim, expect to pay a deductible in the hundreds of dollars. A better way to protect yourself from identity theft is to shred your documents, review your bank statements for unusual charges and check your credit reports. If you’re a CAA member, you can register all your credit cards with them for free. Then if you lose your wallet or purse, you can phone one number and have all the card issuers notified. Being diligent with your personal identification and financial information will go much further in protecting you from identity theft. Auto glass insurance is a policy that covers the repair or replacement of your windshield, rear and side windows, and sunroof. No one enjoys getting chips or cracks in their windshield, but is it worth getting insurance for this? One Canadian insurer quotes a premium of “as little as” $186 a year and then a deductible of $25 to replace three chips or $50 to replace the windshield. Replacing a windshield yourself could cost from $150 to $325. Repairing chips without auto insurance can cost $40 to $50, then $10 per additional chip. As you can see, you could replace your windshield every 2 years and still come out ahead over the auto glass insurance. Insuring against rock chips make even less sense, the insurance would cost you $211, you could have three chips replaced at your own expense for $70. Every time you rent a car, you won’t get away from their counter without either accepting or rejecting their form of car insurance, known as loss damage waiver (LDW) and collision damage waiver (CDW). Is this insurance necessary? It’s best to find out in advance, before you rent the car. There are a couple ways you may already be covered. The first place you should look is your own auto insurance. Contact your insurance broker and find out if your collision and comprehensive insurance covers you in a rental car. Where you are renting the car will also matter, you may be covered in Canada and the United States, but not in other countries. The second form of coverage may be the credit card you use to pay for the rental car. Check the agreement that came with your credit card to see if you have coverage for a rental car. If you are not sure, call the number on the back of your card. You may want to ask for the details of this coverage in writing as all cards are not the same and may not provide complete coverage. With these forms of coverage already available to you, you may not need the insurance offered by the rental car companies, just be sure before you head out on your trip. Accidental death insurance may be offered to you as a rider on your regular life insurance policy. It can also be purchased as it’s own policy. Accidental death insurance pays out an additional amount if you were to die from an accident. The key issue to remember with all forms of insurance is to insure against a financial loss. You put life insurance in place so that, if you were to die, it covers your income and debts for your surviving dependants. With that said, do your beneficiaries need more money because you die in an accident? The cause of death is unlikely to change the financial loss that needs to be recovered. The other issue with this form of insurance is the likelihood of death from an accident is 1 in 20. To pay extra for this rare chance of death is not worth the more costly premium. A lower cost term life insurance will pay out for any form of death, whether from an accident, disease, or natural causes. If you are considering accidental death insurance because you’re concerned that you’re under-insured, it would be a better use of your money to increase the coverage on your regular life insurance. Credit card protection insurance is another case of paying too much in premiums for very little protection. Many people signing up for this expect that it will pay off their credit card if they lose their job or become too sick to work. The truth about credit card protection insurance is that it will only pay the minimum payments, and often only for up to one year. As far as the coverage for illness, you will not be covered if you already have the condition when you sign up. The cost for this insurance can be as high as 1.5% of your credit card balance. 23% with credit balance insurance say they weren’t given full disclosure when it was sold to them. 22% with the insurance say it was never explained the policy was optional. 51% with the insurance say it was never explained that policy would not pay their entire balance if they lost their job or fell ill. While it is a good idea to make sure your minimum payments are covered for times when you’re unable to pay them, you would likely come out ahead by using the money paid on premiums to fund a emergency savings fund. Cancer insurance is a supplemental insurance that will pay an initial amount after you are diagnosed with cancer. Then it will likely cover any amounts for expenses that are not paid by your regular benefits plan. The problem with cancer insurance, or any other kind of disease-specific insurance is that you’re often paying too much in premiums for too little coverage. While it will pay for your cancer treatments, it will not cover related issues caused by cancer such as pneumonia or infection. To be eligible, you cannot have a pre-existing cancer diagnosis. While this makes sense from an insurance perspective, it most likely won’t for you. You would have to be rather sure that you will get cancer at some point in your life, or at least that it’s more likely than other forms of disease and illness. If you have a strong history of cancer in your family, then cancer insurance may be for you. For most people, you would often be better off with critical illness insurance. Critical illness insurance will cover a wide array of illnesses, which will more likely pay out since you won’t have to gamble on which illness you may get in the future. Credit life insurance is purchased so that the balance of your car loan or credit line would be covered if you die before your debt is paid. As with many of the policies in the Insurance You Can Do Without series, credit life insurance in too expensive compared to the premiums for term life insurance. With a set amount such as a car loan, this is made even worse since the amount insurance declines as you pay down the loan. The reason it declines with the amount owed is that this form of insurance only protects the bank that lent you the money. If you were to die, the pay out goes straight to the bank. With term life insurance, you set an amount to cover all your debts, plus an additional amount to cover your salary or maybe your children’s education. If you’re debt is reduced before you die, the insurance payout would still be at it’s original amount, so your beneficiaries would receive a larger amount after the debts are paid. If the cost of credit life insurance, compared to what you get for it, hasn’t made you want to cancel and sign up for proper life insurance, then this might have you getting some life insurance quotes. If you’ve ever signed up for credit life insurance, did you notice how easy it is to get it? There are rather simple, vague health questions and no tests required. If you have a pre-existing condition, this might make you think that this type of insurance is easier to qualify for than term life insurance. The problem is that if you were to die and a claim is made, the insurance company would then begin their post-claim underwriting process. This means that the insurer will decide at that point if you actually qualify to receive a payout, even though you may have been paying premiums for years. Instead of these loan-specific insurance policies, have a look at term life insurance. You can get an idea of the prices from different insurance companies at Kanetix. Involuntary unemployment credit insurance is another type of insurance you can do without. This insurance might be offered with a credit card or auto loan and will cover your minimum payments, usually for up to 6 or 12 months, if you were to be laid off. While the price can vary from lender to lender it is often too expensive for the small amount of coverage you get. Say your minimum payment was $100, the cost of insurance could be $25-50. So with some policies, you would be better saving that premium into your emergency fund for one year as your own form of insurance. Putting the cost aside for now, what makes involuntary unemployment credit insurance even worse is that you might be paying the premiums but would be unable to claim when you needed it. The terms and conditions often exclude those who are part-time employees or older than 65, but much like mortgage life insurance, this product has been sold to those who don’t even qualify for it. So what else can you do to protect your ability to make the minimum payments in the event of a layoff? While adding it to the emergency fund is one option, if you feel your job is rather secure you could instead use the money saved from not paying a premium to pay down more of the principle. This way you’re working towards eliminating the debt and increasing your ability to survive a job loss. Another form of security is to be prepared for unemployment by being ready to find another job. This includes keeping your resume updated and ready to use, as well as maintaining a strong professional network. I went to a trade show this past weekend for parents that are either expecting or recently had a newborn. More than one of the booths was pushing life insurance for your newborn. They were marketing it as cheap insurance that will help you save for your child’s future and protect their rates if they develop health problems later in life. As with most of the insurance policies in this list, the biggest issue is that you have to look at what financial loss it is that you’re insuring against. In this case, you’re insurance against the death of a child. While this is an emotional decision, from a financial perspective what monetary loss will you suffer if something were to happen? There is the cost of the funeral, but otherwise your financial responsibilities would be reduced from not having to provide for that dependent. If the cost of the funeral is a concern, you would likely be better off by saving yourself the cost of premiums and adding that same amount into your emergency savings. For the savings aspect of some of these universal life insurance products, you would be better off with term life insurance and saving the difference in premiums in a low-fee investment of your choice. That applies to anyone, not just children. However in this case, if you do decide that life insurance is unnecessary, you could save the entire equivalent amount of the premium within an RESP and accomplish much more in saving for your child’s future. When it comes to protecting your child’s rates from future health issues, this would be a bit like gambling. To insure for this reason you would probably have some concern that your child will have problems in the future. The problem is, if you know of any family history then you have to tell the insurer and this will lead to higher premiums right from the start, and if you don’t tell them they could deny your claim. As for the insurance being “cheap”, this is simply due to the unlikely event of a child dying compared to that of an older adult. The lower odds mean that the insurer is not taking on much risk, and therefor not increasing the premium. Life insurance should be purchased to cover financial responsibilities such as remaining debts and providing for dependents. Since this doesn’t apply to children, this is insurance you can do without. Everyone loves their pet and wants to do whats best for them. You might have paid for training and special food and certainly realize that pets can be expensive. But what if you pet gets injured or has a disease? You may have considered pet insurance to cover these emergency visits or operations, but that might cost you more in the long run. Pet insurance has limited coverage. Insurers have maximum payouts on various veterinary procedures, so you may not receive as much back as you expected when you filed the claim. Like many forms of insurance, you will not be eligible to claim on expenses related to a previously existing condition your pet may have had prior to getting the coverage. Instead of paying for pet insurance, you should look to increase your emergency fund to at least partially cover any possible expenses. Simply add the same amount to your emergency fund that you would have paid in monthly premiums. Then you will be able to withdraw this money when needed, without any deductible or concerns about whether the procedure is covered by your insurer. Even better if your pet lives a long and happy life without any major issues, you’ll then have additional savings without having lost your money to premiums. Now you can always find people that will say that pet insurance was worthwhile because they received a big payout just months after paying $15-20 a month. And while that can happen, you need to weigh the odds of having to claim early in your pet’s life to the size of the possible expense when deciding if any insurance product us right for you. In this case, most vet bills are not a large financial hardship and savings can be put in place to cover all or at least some of the expense. Long term care insurance is designed to pay out a benefit should you need retirement care such as assisted living, home care or nursing home care. However, long term care insurance may not provide what you expect or might not pay out at all when you need it. First off, you could easily pay thousands of dollars in premiums for insurance you may never need to collect. There are obviously worse things than never needing long term care insurance, but what if you do need to collect on the insurance but the insurer denies your claim? There are many stories of this happening. Whether the insurer does not agree that a certain diagnosis is covered or doesn’t pay as much as expected, these are possibilities you should be aware of. Unfortunately, there’s no way to know in advance if you’ll have any issues when you need to collect on your long term care insurance. Another issue with long term care insurance is rising premiums. While you might pay reasonable premiums for a decade or two, as you get into your later years, the insurer may start raising your premiums by as much as 50% to compensate the additional risk they take on as you get older. If you are concerned about your health in your later years, you can likely put your money better use in an RRSP or Tax Free Savings Account. This can serve as a form of self insurance where you’ll have the money available when you need it, without having to jump through any hoops and red tape. You should also consider critical illness insurance. This form of insurance pays out a lump sum when you are diagnosed with a major illness. Not only can you use the money how you see fit, but it has a better track record of paying out for the covered illnesses. Yes, it really pays off to check your credit reports regularly for unusual activities. I read somewhere that there’s a website which waits for your approval for any transactions your credit card makes. There are ways to protect yourself from identity theft. It’s not impossible to stop. I live in NYC and I think glass coverage is the best thing on Earth. Already got my money worth for it, so it’s one thing in your series I have to disagree with. However, it does appear that our policies are slightly different. Mine has $0 deductible and only adds $2-3 to the monthly premium. Pinyo, At the price your paying, the math definitely works out better for you. I would think if you’re getting at least one chip a year then it’s worthwhile? Wow! That’s outrageous! Here in NZ most car policies have free or close to free optional glass cover. Haven’t had to use ours yet, though our flatmate has had his back windscreen replaced twice this year so he definitely got his $$ worth. If you’re going to shop around for term life insurance, you should perhaps also shop around for brokers to ensure you’re seeing as many companies as possible. An alternative site for term quotes is mine at www.insurecan.com . You may get a different set of companies – or more companies – by doing so :). Waitaminit. Does this mean that Canadian national health insurance doesn’t cover catastrophic illness? If you get cancer, are you not covered? That casts a whole new light on the argument that US health care reformers should look to Canada for a model. It would mean you pay high taxes to get health coverage but STILL have to pay extortionate premiums to some insurer to be fully covered. Is that so? Medical visits and operations are covered. Other items like prescriptions or loss of wages are not. Many people have prescriptions covered through their employer or a plan like Blue Cross, but these might only be 80%, the insurance would cover the remaining. But yes, when needing medical attention, that’s covered. I have a few questions for you. Do do know any who got cancer, heart, attack stroke, MS,had to get coronary artery bypass surgery, Alzheimer’s disease, Deafness? plus a number of other problems not listed here. Can you get 8% every year on your money? For the next 20 plus years had you not bought the policy and invested it? Did you know that the coverage offered in Canada can not be bought for the same guarranteed rates in the US or in UK? If you want to learn more drop me a line. Brian, I think critical illness insurance is a well worth the premiums since it covers a wide array of issues, as I stated in the final paragraph of the post. However, I think that insuring against one specific disease, without any prior diagnoses, is a bit of a gamble. Credit insurance is expensive. I agree it is much better to get simple term insurance. It is tough for the average person to shop around for life insurance. Many Canadian looking sites are actually American. One thing people should know: Most sites that offer free life insurance quotes are owned by life insurance agents. If that agent does not represent a certain company, he or she may not display it in their quoting engine. It is best to check out a few sites. One site that is Canadian, is free, and does not exclude any companies is http://www.shopforinsurance.ca . Do not buy mortgage insurance. The people who sell it are often not even trained in insurance and do not understand the actual policy. They are trained only how to sell it. Get an inexpensive term life insurance policy instead. The thing to keep in mind is that this insurance does not pay the $7000 you might owe on the credit card, just the $100 minimum payment. It’s still comes down to personal choices, so of course it is marketed in an emotional way. But I like what you said about life insurance being cheap. My dorky way of explaining it is that life insurance is cheap when both the policy owner and the life insurance company agree the risk is low. Life insurance when they agree the risk is high. If they ever disagree, you either don’t have a policy or you have a great deal. That seems to make sense, not sure why a child would need life insurance. The only thing that would make sense here is a term product that protects their insurability in a meaningful way. Of course that is gambling – all insurance is. And from a financial perspective it is always *on average* a losing gamble. But that’s the point – you gain security by playing. The value proposition is entirely about getting into a large pool as soon as the world knows you exist, but before it could possibly know about your potential health problems. Bonus points for making this a multi-generational product that automatically covers any insured’s children, if they choose to begin making premium payments at birth. Why doesn’t this exist? Because regulations forbid it. Most state regulations have been created, either by whole-life lobbying or by sheer political meddling, into demanding that policies over a certain potential term or that represent a certain amount of total premium payments must build a cash value. In other words, pure insurance products of the sort I suggest are currently illegal. A cheap term life product would be an improvement. So far all I’ve had thrown at me have been policies that push a savings aspect. Unfortunately as savings vehicles, most of these are even worse than many of the high MER mutual funds I’ve ditched in the past. I love my children but life insurance seems a little ridiculous for a young person. This is clearly a very personal and delicate subject. It certainly confronts a parent with a rather dark idea that they would probably not like to face. The whole thing about insurance is that its about probabilities. So a parents attitude will be based on attitude to risk, and possibly even ‘rules of thumb’ (heuristics) a powerful one being the ‘availibility heuristic’ which goes along the lines that if I have heard or a child dying in my social set then I realise that it can happen and that being so ‘close to home’ I’d better prepare for the eventuality because I’ve seen it happen. I disagree with this advice. Parents should purchase life insurance for their child as a gift to their child’s future spouse. My parents did this for my brother and I. A few months later, my brother was diagnosed with Type 1 diabetes and would be insurable. So a good more there. For me, my premiums are much less than what we pay for my husband (who did not have life insurance) when we took out a policy on him when we got married at 21 and 22. My parents decision when I was 12 has paid huge dividends to us in terms of life insurance security as we get older. So maybe you won’t benefit from the life insurance payout as parents, but your child in-law(s) and grandchildren may. You talk about the emotional aspect of loosing a child, does that have a financial affect? I would say it does. Do you think you loose a child and want to run back to work or do your normal things? It takes time. It can have a financial affect. Everyone is different and loosing a child is definitely as situation you can’t prepare for. @Jen makes a great point about it being a future gift. @Ethan Buy a $100,000 WL policy with a guaranteed insurability rider. This will allow you to purchase more insurance at the major life events such as you mentioned. The face amount will climb depending on how you fund it. You can cancel it and walk away at 65 if you choose and get money back. You make some good points about future premiums that I didn’t fully cover. It may still come back to what you do with the money saved by not paying the premiums. If it’s actually being saved, then you could have a somewhat-predictable amount saved by the time the child is an adult. This could outweigh any increased premiums that need to be paid. It certainly depends on the situation that each person finds themselves in. If something where to happen to my child, having the payout would be very beneficial. I however prefer to focus on insuring against financial catastrophes that I couldn’t otherwise afford to cover, like my house burning down or something happening to me and my ability to pay the bills. I also agree with Jen. If said child ends up with a health issue that finds them uninsureable, that one little policy may be all that they have for their entire life. As a gift for your child’s future family, I think it would make sense given it is a small amount. For example, a young person diagnosed with cancer, who may already be married, with a young family but did not purchase insurance yet, or a young person who needed an organ transplant. Either would not qualify for life insurance, or it would be too high to justify. Even a small policy covering just a small payout would be something for the future family should anything ever happen. Heaven forbid, of course. We’ll take out a small policy on our future child only for these reasons. I am going to retire from my company and i have bought some mortgage policies for my future but some one called me and told me that company is going to change their policies and i will resubmit the policy papers and have to pay some extra charges for that, i am really worried about that what should i do? can you please suggest me anything? @Tom Thank you for the great topic and conversation. The problems with the savings policies you mention is probably not the policy but the person selling it to you. Permanent policies have a ton of funding flexibility. Most people don’t realize this and it’s the funding that gives the policy most of it’s performance. I was aware of coverage for rental cars on personal auto insurance but I never heard of coverage on credit cards for rental insurance. I sure learn something new today and in fact I am about to make a call see if I have this kind of insurance. Thanks for the tips! I’ve never heard of stand alone auto glass insurance, course I’m in the US. I have comprehensive coverage that includes glass as well as some other things. Glass coverage has zero deductible. I’ve had my whole windshield replaced even with just a chip in the windshield. In the last 10 years I’ve had 2 windshields and two side windows replaced. I always ask how much they cost and the most expensive one was a back side window that I was told was a $2,000 piece of glass. So I’ll always carry glass insurance. My wife has ovarian cancer.. I’m glad to live in Canada because it’s all covered.. Her loss of income isn’t covered though. We didn’t know it was cancer until she actually had the operation… They told us that it could be a cyst, and it wasn’t guaranteed to be cancer. Sorry to hear that Monty, and yes, it’s nice to live in Canada and have the medical expenses covered. When dealing with long term investment it is a good idea to have some sort of protection is something unfortunate was to happen and are not left out of pocket and in trouble. When my mom divorced my dad she carried on the mortgage but legally his name was still on it and they got insurance on the mortgage so if anyone died the mortgage will be paid off. Sadly my dad died 6 years ago and when a fiancé advisor asked mum about the mortgage when she was getting help found out there was some sort of life insurance on the mortgage and the house got paid off which was crazy news out of the blue. Many of the companies named in the Marketplace report are underwritten by American Bankers operating as Assurant Solutions in Canada. They underwrite credit insurance for: GE Money, HBC, TD, Canadian Tire, RBC, MBNA, Presidents Choice, American Express and many others. Essentially the coverage for all of these insurance packages is often similar yet the cost per $100 for coverage ranges widely; not always an identical value to the client. Also, you should be licensed to sell insurance; few of their sales agents are not licensed. Credit insurance is a major money centre for financial institutions and people depend on the money they’ve provisioned for in the event of a claim. After the recent financial meltdown, we know banks are not great at regulating themselves. Certainly, the banks have protected themselves, who is protecting us? my parents had mortgage life insurance and when my dad passed away my mum only found out later that the mortgage could be paid off because of my dad’s passing which helped my mum a lot as the house is now hers. Nice series, Tom. I always wonder about foreign car rental insurance. I guess I should just call my credit card and insurance before hand? 1st, in most states and provinces (US & Canada), this is NOT a stand-alone premium. It’s usually already included in your comprehensive coverage for your car, BUT you are in fact paying extra for it. They don’t tell you that though. They just tell you, yes, yes, that’s all covered with your comprehesive coverage. You’ll be surprised how much glass coverage actually costs. It’s average $180 per year on your car insurance. 2nd, logically, it’s true that if the cost of the auto glass repairs exceeds the cost of of the insurance coverage, multiplied by the risk factor (ie. parked indoor/outdoor, good/bad neighbourhood, lots of high way driving behind trucks, etc. ), then you should get the glass coverage on your insurance. BUT, if you don’t think that you’ll run into any glass damage, I say, opt-out for it and save yourself the average of $180/yr on your car insurance. Your broker will usually not give you this option unless you ask! So, think about your situation, and ask how much it actually costs for you to have the coverage vs. repair costs (if any that you may run into), and make your decision. I work for Allstate Insurance, so I know. A lot of folks do not know about this ‘option’. They think it’s all included, but nope, you are paying extra for it my friends. For most of us quite frankly there’s little financial need to insure a child for any large sum of money. In most cases an individual policy is overkill and a sales job. If you want a small bit of insurance on your kids do as noted above and get a children’s protection rider on your policy. That’ll give you a small bit of insurance, like $10,000, and at a very cheap price. The second thing people are talking about here is guaranteeing future insurability. What’s being suggested is that people buy an individual policy for no other reason than to guarantee their future insurability (then they pretty this up to make it like it’s a gift, which isn’t a financial decision btw, it’s an emotional decision – don’t confuse the two). Children’s protection riders handle this as well – they typically allow the child to carve off that 10,000 of insurance and get their own policy when they’re adults. Many companies allow 5X the initial amount without a medical exam when the child’s grown. Manulife’s gone right crazy and allows the child to get $250,000 of insurance without a medical exam when they become adults. So there’s still no need for an individual ‘whole life’ policy on children. In short, for most people, a simple rider for $5-$7 a month will do every bit as much as an individual policy, but cheaper. solution to protect our identity. It is a good thing that we have information monitoring services to assist us, but we still have to do our part in making sure that no one else makes use of our private information to their advantage. I’m 100% convinced now that term life insurance is better than mortgage life insurance. I would much rather have a specific dollar amount in my insurance than have it change every month as my principal payment decreases. Agree, if you have personal insurance, you should be covered. That’s not even to mention the credit card protection most cards offer. life insurance for children should be given consideration however life insurance for the parents is recommended first. Luckily there is a lot of information out to help us understand and protect ourselves from these heartless criminals. One thing I didn’t see mentioned here is that if you are renting a car while on business, oftentimes your employer may have you covered for rental insurance. If you are going on a trip, find out beforehand whether you’ll require rental car insurance. It’s not a decision you want to make in haste at the rental car counter, although in most cases the rental car insurance is not necessary. Identity theft is a big and most of the time unexpected problem for many. It can destroy someones life and leave them with nothing. It is a great idea to get this insurance and protection. I think that mortgage insurance does have its pros and cons; you just need to analyze your current situation so that you can determine if you actually need mortgage insurance. Thanks for the information. People should be careful about buying life insurance. One way they can do this is by getting a needs analysis to find out what kind of insurance they need. Parents would do better insuring themselves rather than their child. A child’s death has a huge effect emotionally, but as the head providers, it would be a huge financial blow to children if their parents were to pass away. Having some type of life coverage is a good idea once you purchase a home. Whether it’s mortgage or term insurance, as long as you can get approved for an affordable rate, that’s likely the best option to go with. I completely agree with you. I looked into pet insurance for my Great Dane, as well as for my horses (livestock and pet insurance inquiries), and I was astonished at just how limited the coverage was. Basically unless someone ran them over or they were hit by lightning, there would be essentially no coverage. Since then, I, too, have added my pets to my emergency budget. An increased emergency fund is by far the best way to “insure” your pets. Get’s all the loopholes out of the way. I would not pay for pet insurance, but still would cry a lot if my cat died… So I like your emergency fund idea. I think another thing to consider is the limit you want to spend for your pet. Vet can be very very expensive so from day 1 you have a pet, ask yourself how far you’re willing to go for those expenses. Yes, even with an emergency fund, you may not want to completely empty it for a major operation on an older pet. Forgot to say, I think great pets such as horses do deserve a basic insurance as they can be considered more as an investment than a cat or a dog for example. But only if the insurance can be claimed. Too many restrictions can make it almost impossible to qualify depending on what happens to the animal. I quit my pet insurance a few months ago and could never be happier. I would rather rely on myself than hope and pray that my insurance company would pay for it (when often they denied it). It’s okay when you’re paying for big things, like accidents I suppose (and only paying $10 a month or something). But with the annual deductible (which can be $250 a year) and the copay which is usually 10-20%, I don’t really think it’s worth it. I think the same is true with dental insurance based on the same premise … by the time you pay premiums, pay into the policy through a waiting period (sometimes a year for major procedures), pay a co-pay, then pay co-insurance, is it really worth it? I agree, stash away cash & you’ll save money. We read the brochures for pet insurance when we got our dog and it didn’t seem to be worth it. Good move Kay Lynn. The fact they push the insurance at pet stores and vets is a bit of a red flag of how profitable these policies are. Most truly needed insurance isn’t marketed heavily. It really depends on where you are. I know if I live in places like Thailand I would acquire an accidental death rider because of the high numbers of bad, drunk and unlicensed drivers here. Many people forget what a credit card is: it is a plastic card that helps you pay for purchases in advance, after which you can consolidate the payment at a later date. It is not a license to go shopping spree, a debt management avenue or an insurance of any kind. Wake up people. With so many website keeping your data nowadays it is important you visit only secure, genuine websites. Those who are in favour of high risk sites such as gaming, gambling or adult sites are more prone to have their identities jacked. Have to agree with Peter usually glass insurance is already included with the motor insurance; I wouldn’t fork out extra for that in any circumstances. While there are many good points to the argument on this page, insurance for your child does have many benefits. Carriers like Gerber and Globe offer great rates. I know that Globe offers the first month’s premium for $1 dollar. Either way, its something that should be considered and purchased if it makes sense for your budget and needs. When we lost our dog to bone cancer in September, we submitted $1300 worth of eligible receipts and received a grand total payment of $150 in re-imbursement! In five and a half years, just a very basic policy cost us about $1600. If we had created our own fund, we would have been $300 ahead instead of $2750 behind. Thank you! This is one of the Great Rip-Offs of the Western World. Take a look at the fine print: most of them cover nothing more than the occasional car accident. If you don’t let your dog run around off the leash, it’s unlikely to get hit. Friend of mine had the same experience as Lesley’s: had his dogs massively insured, and when one of them developed a serious illness discovered the “insurance” covered almost nothing. Completely (yet respectfully) disagree Tom. The reason I have pet insurance on my dog is so I never have to ask the question – is the procedure too expensive. I never want to have to make that decision. In 2004, Solutions Financial was created, to provide pressure-free buying of individually underwritten Life Insurance from competing insurance companies, by phone. Since then, we have helped countless people save money on Life Insurance often hundreds of dollars less than what they could have paid elsewhere. From the carefully selected companies we represent, we provide you with the best price for your described needs. The insurance company can change its policy of payback anytime it wants. The self insurance you mentioned is a better choice. Long-term care insurance policies are contracts. The insurance company cannot unilaterally decide to change the terms of contract. Self insure??????? Good luck with that. The federal government recently did an audit of the claims practices of 7 of the leading long-term care insurers. I think the main problem with LTCi as it is being sold today is the uncertainty that Tom talks about. Doable Finance wasn’t talking about the premiums. He/she was stating incorrectly that the conditions for qualifying for benefits and the benefits in the policy, could be changed at anytime by the insurer. I’m from the US and not Canada, so I’m not sure if this is available, but we have hybrid products that can take a lump sum of money and use it for one of three purposes depending on your circumstances. 3. Return of premium if neither #1 or #2 occurs. I think you should learn more about long term care before you offer an opinion. I’d sure hate to have you as my retirement advisor. Steve, if I stated anything incorrectly, please let me know. I research my posts in advance, especially the “Insurance You Can Do Without” series as it leads to many comments from those that have had good experiences (always good and bad stories with anything) and also those that sell the insurance. Everything else in the article is fine. Scott, there are many stories of people being denied when they need the benefit of the insurance they’ve paid premiums on for so long. some of these stories can be found in Money Sense and USA Today. Much like most of the posts in the Insurance You Can Do Without series, they come down to being overpriced and/or have shaky records for dependability. It you can’t count on the insurance being there for you when you need it, I recommend that the money is better spent in an RRSP as a form of self insurance that will grow tax free until the age you’d be needing it. As an added bonus, if you fall in the majority of people that don’t need long term care, then you’ll have extra funds to share with loved ones through estate planning. When you did your research, how much money did the LTC insurers pay in claims last year? How much have they incurred in claims over the past 20 years? What did you think of the Dept. of Health & Human Services audit of LTCi claims that was published last year? Sorr, sent it before finishing it. Report both sides…fairly. But as an advisor to say long term care insurance is something you can do without. That’s irresponsible. I have paid homeowners insurance for 40 years. Never had a single claim…never had to use it. I hate paying for it…but I wouldn’t do without it. Nobody likes paying for ANY type of insurance, but sometimes it makes sense to include these coverages in our portfolios. I personally found that other credit card insurances e.g. Purchase Security or Medical Travel are more valuable pieces of credit cards. Passing that to you since it might be helpful for other readers as well! I totally agree with shredding the documents to avoid identity theft. With the insurance thing, I don’t think so if you’re just a simple individual. You maybe have quality knowledge of what your discussing or just did some great research but I like it so much. Sometimes is necessary, this insurance. One time i went to Germany and i want to rent a car. I had a driver license but i was not covered by m insurance, so i had to pay it. you guys are so right, credit life insurance is a screwjob! term insurance costs 2.00 per 1000.00 of insurance and is very inexpensive. credit life is not only expensive but i most cases the institution your getting the loan from borrows the money to buy you the insurance and then adds the cost to your loan and you get charged interest on the loan and your payment will increase anywhere from25-50.00 a month. depending on the amount financed. also staffers at the bank are not even licensed to sell these products, only in the province of alberta is it manditory to go get licensed, here in novascotia we see this type of abuse with every middle income family we help. i have had clients who have spent up to 300.00 a month on credit life, and we could give them the coverage they needed for 20.00 a month. terrible product, BUYER BEWARE!!!! your banker is not your friend HE IS A SALESMAN looking to make a commision!! I once got a free rental courtesy of the auto dealership when I brought my car in and didn’t get the rental insurance because my own car insurance covered it. However, my policy had a deductible and the rental insurance didn’t have one so I ended up paying $300 for my deductible cause some guy pumped into my rental car while parked and took off! I was really mad at myself for not paying the $10 / day after that. This really depends what car you drive and where you live. A windshield for an Infiniti G37 here in Canada cost nearly 1,000 to replace and about $300 in US. Also, glass insurance is sometimes included in a package and cannot be dropped without also dropping other coverage like rock chips. I used to think rock chips were minor and I’d never pay my $300 deductible to fix a rock chip until I brought in my BMW335 to get a tiny rock chip on my headlight fixed. 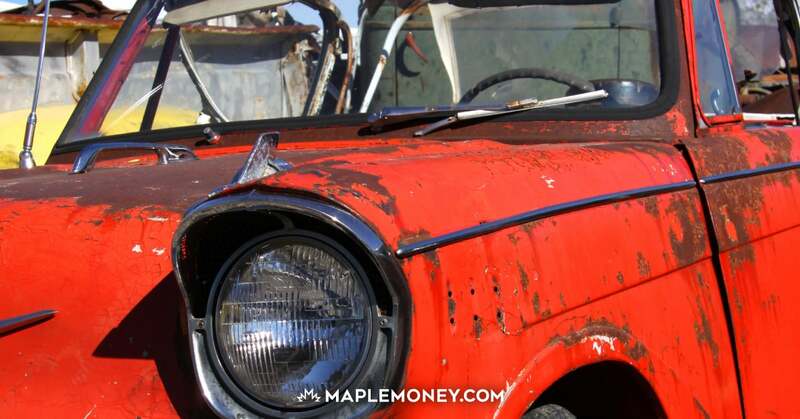 It ended up costing $2,000 Cdn because the only way to fix it was to replace the entire headlight!! You obviously put a lot of work into that post and it’s very interesting to see the thought process that you went through to come up with those conclusion. I was aware of coverage for rental cars on personal auto insurance but I never heard of coverage on credit cards for rental insurance. I sure learn something new today and in fact I am about to make a call see if I have this kind of insurance. I would say put a small child rider on your policy, you can look for a policy that will cover your children with one monthly fee that will cover as many children you have. You can protect their future insurability if the company has the option to convert the policy when the child becomes an adult. For example, you could take out a rider for say $25,000 and have to option to convert to $100,000. Another option you can look at is a paid up policy. You might want to give a child or grandchild a policy as a gift that is paid off for the rest of their lifes even when your gone. It is not always about savings. Definition of Life Insurance – Life Insurance Quotes And Term Life Insurance Agency Specializing in life Insurance Quotes.It not only provides financial protection to the dependants of the insurance policy holder, but it as well suggests a grand device for maintaining one’s funds. Well, rentals coverage has been around for a while. Most people don’t know they benefits and fail to take advantage of it. Well my brother has a medical condition that made him uninsurable as an adult. I purchased an equitable universal policy for my children with savings. So there base amount of life insurance is 130k; they then have the option of purchasing an additional 50k at different ages up to an additional 250k T different ages in their lives. I have also purchased them a sunlife critical illness policy with return on premium for 250k; it has an option of purchasing a weekly disability benefit when they are older and will give them another 100k return on premium besides a 75% return of my premium. I am also maxing out their RESPs. My wife. And I have chosen to buy our vehicles 1 to 2 years old and drive them for 10 years to help pay for all this; but setting up our children with savings and protection is very important to us. not, your policy will not respond to rental car damage and loss of use claims. Yes, credit life insurance is expensive and it is better to get Term Life insurance. If you are looking for term life insurance, it is better to contact a life insurance broker in your locality. For this, you can get in touch with Life Guard Insurance. Check out their website. Be aware of Zoom rent-a-car. The insurance is not included in the price. Apart of that they charged me 530 CAD for a 5 cm long scrape at the bottom of the bumper (a place out of the view but checked very first time – sure was a set up). The dispute was solved due to a complaint sent to the manager. He proposed a fair solution. Now maibe he is more aware of his employees. Dont EVER buy this crap. I have sold it on the phone. We were told we had to sign up 1 of 4 people calling into, ostensibly, to activate their cards. However, at end of the process they get a telemarketer who persists and tricks the customer into taking the coverage upon pain of dismissal if we dont. Thanks a lot for blogging this, it was unbelievably informative and helped me tons. Renting a car certainly gives you freedom and flexibility when traveling in Canada. You’re not tied to a timetable and you can go to almost anywhere of interest. Just make sure, however, that you know your route before you start so you can have a safe and enjoyable journey. I read your blog on “New Year’s Resolutions: Looking Back” today and was hoping to share with you the CBC: Marketplace video regarding mortgage insurance after reading about your new home purchase. I searched to find if you have blogged about it before. I am happy to find that it was one of the first insurance topics you did. Keep up the good work, and congratulations to you and your wife on your first home purchase. I wish you a very happy and prosperous new year! This is a nice series of insurance you can do without. Id theft insurance as a stand alone product certainly is something unnecessary. Really important for people to realize how serious identity theft is and that they can do more by themselves to prevent it. Life insurance exists to protect people’s dependants, usually unemployed family members. Unless we’re talking about a child star, children generally have no dependents, rendering life insurance unnecessary. The important thing is for the adults to cover them by properly insuring themselves to protect their children in turn. It is hoped that insurance companies would explain this to a potential client. Increasing the awareness of the pitfalls of mortgage life insurance is a big issue. It’s a shame that the onus of duty is on the banks, who have a natural bias towards pushing mortgage life on homebuyers who are likely in a state of natural confusion and stress. Keep spreading the word Tom, I’ll do the same! Great points made on both sides. If you feel like your child may be at risk it can’t hurt having. It’s very tough arguing against something that may be important if its only a few dollars a month to purchase. People are often confused about what companies like LifeLock actually do. Many think it will stop identity theft from happening but the truth is it can happen to anyone whether or not you have “protection” or not. I agree that careful prevention is the most effective step, but it could still happen to even the most careful of us. Insurance really is good for everyone of us, there are many great insurance packages out there. Me, i live in australia and we have really good service in terms of travel insurance also in case of emergency we will not worry anymore, just in case though. Also pick a set of package you want and will be very applicable to you so that you will not have any problem about it. As we know car rental is a good business and a way of providing car service to the needy customer when they want in a reasonable price. Due to poor many people are not able to buy a car. In such situation car rental or sharing is the best way to have a car for use. But the condition of car rental differs from one country to other. We have to know the criteria to get the car rental service within a suitable condition. When we go for a holiday to outside of our country it becomes quite impossible to know the criteria of car rental in that country. In such situation this type of blogs are very useful. Great post! I never would think that credit cards are also a form of insurance (well can be) if your do your research. It doesn’t hurt to try, then you won’t have to fork out all this money for unnecessary coverage. Thanks for sharing! I agree with Matt, in third world countries like Thailand, India, Indonesia and China where there are lots of dangerously untrained drivers moving around, death insurance is a necessity rather than a luxury. Well, you just assume the cost of the windshield to be between $150 and $325… Did you do your homework on replacement cost? My Infiniti QX80’s windshield cost $1900 to replace, and it was for my own pocket because I listened to others like you. EXPENSIVE mistake. And my Land Rover’s windshield is even MORE expensive…. Please rather qualify your statement before you misinform some people. Great post! I suppose for most people it would make sense to calculate their overall life insurance coverage which would include mortgage debt. This is what we did and I am pretty comfortable with my wife’s and my own life insurance. I self insured my 3 German Shepherds 10.5 years ago when they were puppies. I put away 300.00 per month which was about what insurance was going to cost for them. The same plan now would be closer to 400.00 per month for all of them. I have spent 14,000 on one dog (2 knee surgeries, cancerous tumour removal), 5,000 on another (knee surgery) and 2,000 (2 minor surgeries) on the other. This does not include annual check ups and other basic vet care nor does insurance cover this. With insurance I would still be paying 10% deductible and 13% sale tax(Ontario, Canada). The dogs have/had $37,800 in their account – 21,000 =$16,800. $16,800 is the remaining balance and this amount grows every month. With insurance I would have nothing but would have paid out the same amount in premiums. Pet Insurance is only for those people who cannot save money and leave it “for a rainy day”. I am financially astute but this is really simple math and a financial background is not needed. Have you compared the pricing on permanent insurance on the life of a child against term insurance on the life of a child? Look at a limited pay whole life policy, for example. Term insurance on the life of a child, which I understand is not your primary recommendation, is simply not a good deal when compared to permanent. On the topic of insurability, yes, you are gambling. All insurance is fundamentally a gamble. In fact, the history of life insurance is inextricably linked to the history of gambling. And on the matter of insurance for children, I gambled and lost. Before I was in the insurance industry, nobody talked to me about insurance for children. I have three children. One of them would never have been insurable, from about a month after birth, so don’t worry about that one. The second started using illegal drugs at a young age (as some kids do) and is now uninsurable. The third, our youngest, we got insurance on at a young age, and I am grateful for it as he moves into adulthood. At the very least, I know that he has some basic insurance in place that will be with him for the rest of his life. This financial security cost me $30 per month, and, as is typical with par policies, we are are now seeing dividends larger than our total annual premium. How many other parents have children who were diagnosed with disabilities or developed lifestyle habits that rendered them uninsurable as teenagers? I am curious to hear your comments. >>>Her loss of income isn’t covered though. The correct coverage for this is long term disability insurance, not critical illness insurance.